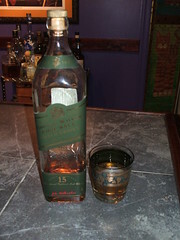 With the current Whiskey/Whisky binge I thought I'd break out my stash of Johnnie Walker Green. Sadly I'm getting close to the bottom and with a $50USD price tag, it may not get replaced. Not because it's not worth it, but there are so many to be tried. Tough life I tell you. Anyway, JW Green is a vatted malt whisky consisting of a blend of around 15 individual malts, including Talisker (The only distillery on the Isle of Sky, and famous for a salty, high peat content), Cragganmore (a Speyside regional Scotch), Linkwood and Caol Ila(From Islay region with floral and peppery notes). All Johnnie Walker Scotch Whisky is produced in Kilmarnock, Ayrshire, Scotland. Where it gets confusing is that most Johnnie Walker Scotch is a collection of Single blends from different distileries, its the joining of specific single malts that give each blended Scotch their distinctive flavors. The taste is very pleasant with the characteristic peaty flavor you should expect from a Scotch Whisky. It is very smooth and has a caramel finish and a pleasant mouth burn. I always enjoy a few ice cubes as most Scotch comes alive with the ice melt. This bottle was a gift and was purchased in a Duty Free store, so the price paid was around $40 making it worthy of purchase. There are more pleasing Scotch whiskys in the $50 range in my humble opinion. It's good, and I'm very glad to have enjoyed drinking it.